The Keg Steakhouse (web site, map, 1499 Anderson Street, Vancouver, BC, Canada, phone: 604-685-4735) is a restaurant chain with a location on Granville Island, and several others around Vancouver’s Lower Mainland area (visit their website for a list of their other locations). I like the Keg. The food and service is consistantly good, but my problem is I always order too much steak. I have a soft spot in my heart for the baseball steak and it always beats me. Next time I visit the Keg I will explore the menu a little bit more. 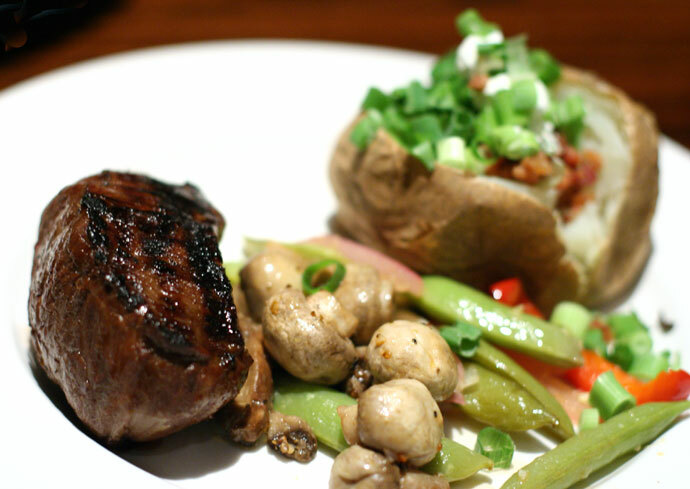 The Keg is great for a quiet dinner with friends or even someone special. The many nooks and crannies of the restaurant are cozily furnished and have fireplaces throughout. There is also a bar area with upbeat music. I ordered one of their Keg Classic Dinners, the 8 oz Teriyaki Classic Sirloin steak with a Caesar salad (both pictured below, $23.95), and it was served with a selection of stir fried vegetables and a big baked potato. I especially like all the toppings they have for the baked potato: green onions, sour cream, butter, and bacon bits. They also served some very nice sourdough bread (with big pieces!) while we were waiting for the meal to arrive. The steak looked small, but it was actually quite filling. 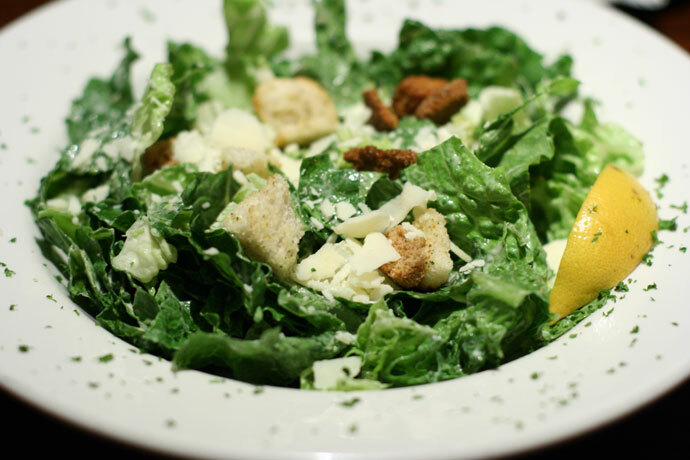 Caesar salad at the Keg Steakhouse restaurant. 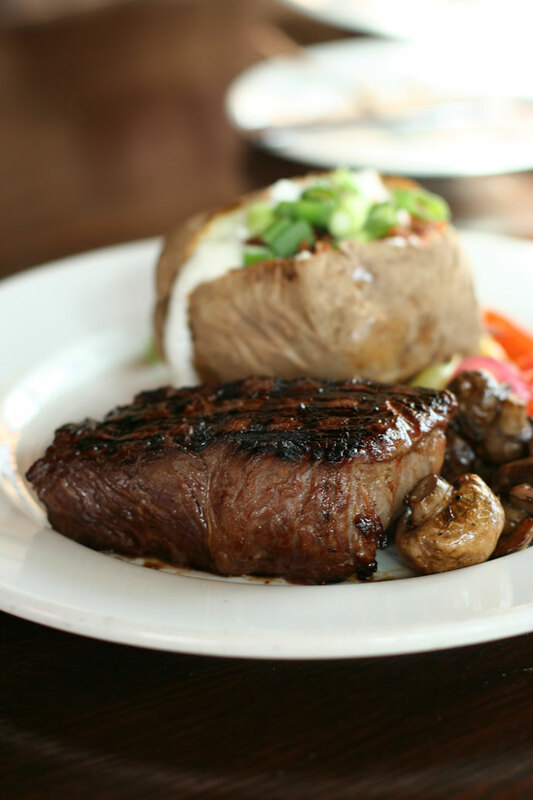 8 oz Teriyaki Classic Sirloin Steak ($23.95 including Caesar salad) from the Keg Restaurant on Granville Island. 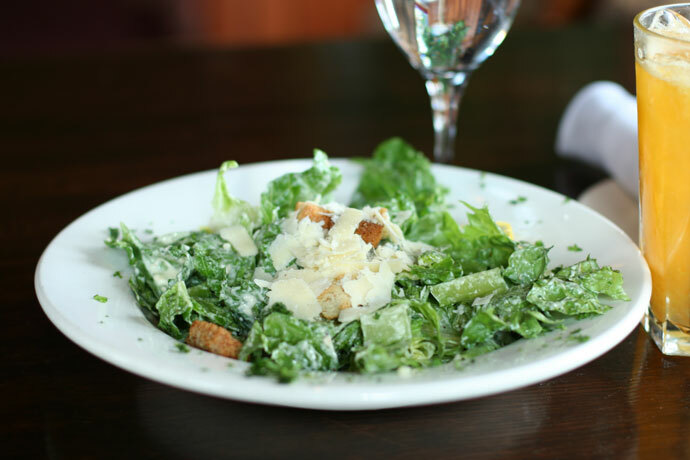 Milestone’s Grill and Bar (map, web site, 2966 W. 4th Ave., Vancouver, BC, Canada, phone: 604-734-8616) is a popular casual/trendy Canadian restaurant chain with several locations in Vancouver. 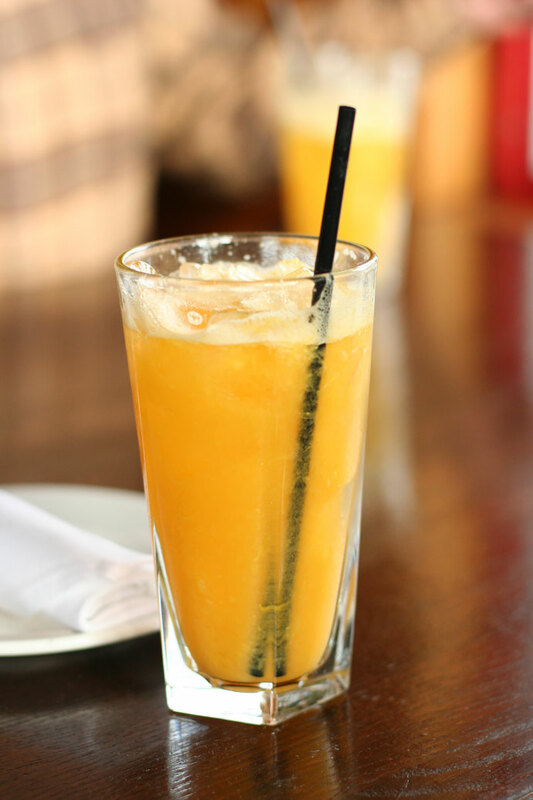 Milestones is known for their steaks, rotisserie, and pasta dishes, but they also have a great brunch menu, which is available on weekends. I ordered their Grilled Shrimp California Benedict ($12.99, pictured below) which was a creative variation on the classic Eggs Benedict, served with “spicy house-made avocado salsa, double-smoked bacon, [and] large grilled shrimp.” I was really impressed by the presentation of this dish and it tasted great – the bacon, eggs, shrimp and hollandaise sauce were a nice combination. Visit Part 6 for another photo and more information about a different location (Yaletown, downtown). 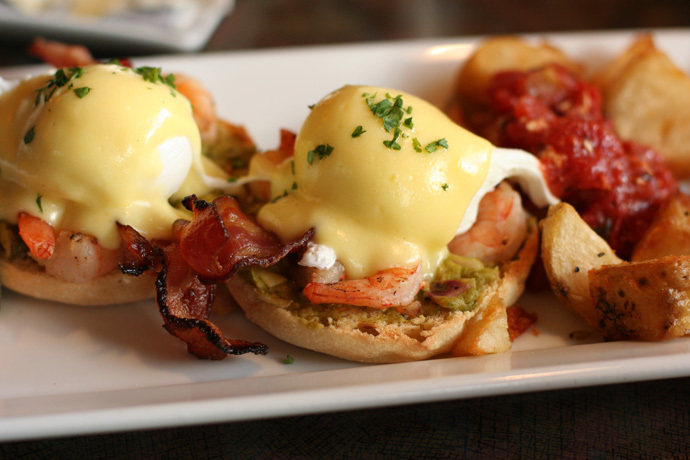 California Eggs Benedict with Shrimp ($12.99) from Milestones Restaurant in Vancouver. View More Restaurants in the Bar category. 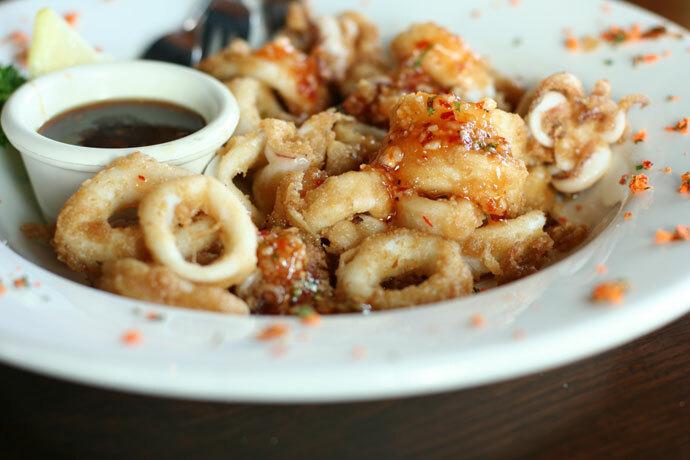 We hope you enjoy the great Bar restaurants on Dine Out Here Vancouver.